Please, send me more information about ref DMD1407 in Cancelada, Estepona or similar properties. 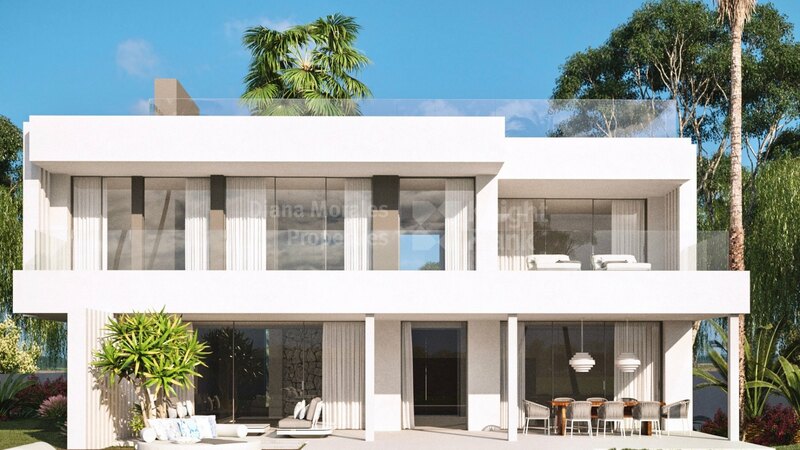 Complex under construction of 7 villas, with south-facing orientation located in Cancelada and approximately 500 mt from a shopping area with supermarkets, pharmacies, cashiers, and other services and approximately 9 Km from San Pedro Alcántara. Villas with plots ranging from 880 sqm to 1730 sqm and interior surfaces from 417 sqm to 435 sqm. The villas comprise three bedrooms and offer the possibility to add additional living/entertainment areas at basement level. Designed with large windows to make all the rooms bright, and with high-quality materials in line with the new trends. Porches and terraces around the garden and private pool complete the exterior to enjoy the sun and the good temperature throughout the year. The concept of living and dining room with an integrated kitchen to create spacious rooms that are committed to a family lifestyle. The deck terraces are ideal for the installation of a Jacuzzi with a chill-out area and BBQ to enjoy the unbeatable views. Other characteristics of the houses are: staircase with metal rungs and glass balustrade, bathrooms Duravit, hydromassage bath in master bath, air conditioning cold-heat with installation Aerotherm, wáter-heated radiant floor throughout the house with pump installation and electrical in the bathrooms, sanitary hot water with installation of Aerotherm, aluminium metallic carpentry with multipoint closure and Thermic Bridge break, with liftable system in large windows, crystals Thermo Acoustic and solar control Climalit, armoured security entrance door and multipoint lock, lacquered solid doors, anti-impact rubber and water-repellent board, complete cabinet cladding. Kitchen design including Neff brand appliances or similar and countertop and Silestone top and front. Alarm including smoke and flood detector kit, safe, video door phone, white electrical mechanisms brand Berker, private outdoor swimming pool with air conditioning preinstallation, a garden designed by a landscaper. HEAT-COOLING AIR CONDITIONING BY AETOTHERM. So you want rustic charm and some land around you but are not prepared to move deep into the countryside. It seems a common dilemma, but occasionally you do find a property that is a country villa not just in style but also in space and scope – yet situated on the doorstep of town and beach.